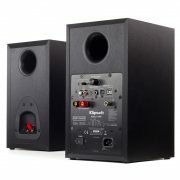 Want a great sound system in your office or den? 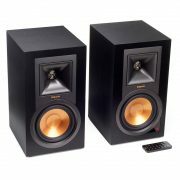 Check out the Klipsch Reference R-15PM powered bookshelf speakers. 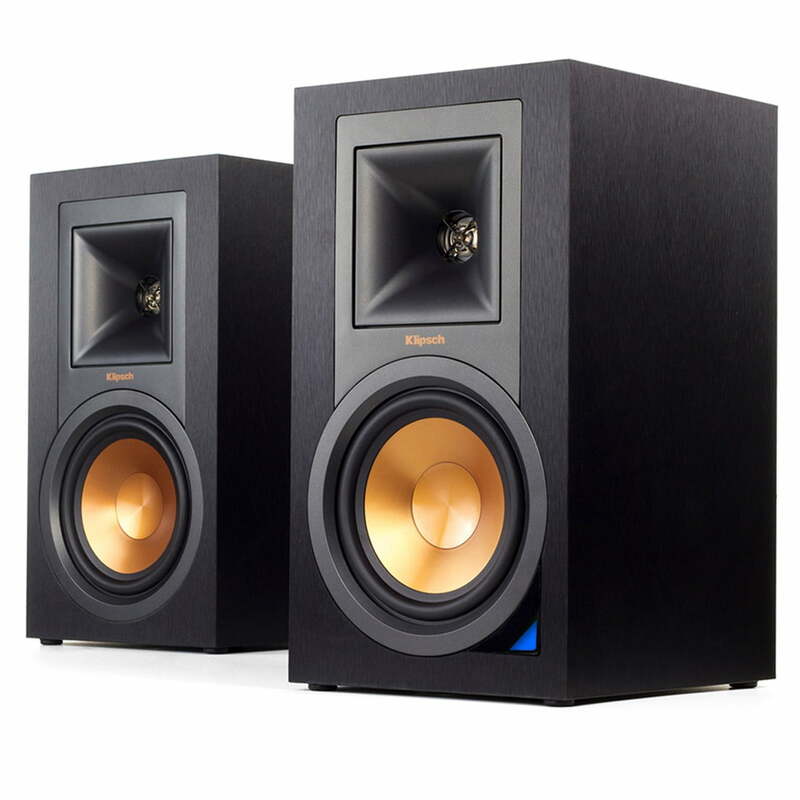 With 50 watts per channel and tried-and-true Klipsch speaker technology, these compact monitors can deliver room-filling sound that’s richly detailed. And they’re ready to handle just about any source you can imagine, thanks to built-in Bluetooth, an onboard phono preamp for your turntable, and versatile digital inputs. Want to breathe some new life into your vinyl record collection? Just connect your turntable and flip the input selector switch to “phono,” and you have a compact stereo system that’ll fit easily in smaller spaces — no receiver or separate amplifier required. The speakers also feature an optical digital audio input, so you can run digital sound from your TV directly to the R-15PM speakers — ideal setup for watching videos in a bedroom or guest room. A mono subwoofer output lets you add a powered sub to make movie soundtracks really come to life. The R-15PMs also have a USB Type B input for connecting your PC or Mac. Forget using your computer’s headphone jack — this direct digital connection is the way to get much cleaner sound from your digital music files and streaming sources. But speaking of headphone jacks, the speakers also have a stereo minijack for those portable devices that don’t have Bluetooth. Two-Way Driver Design: The Klipsch R-15PM powered bookshelf speakers deliver room-filling sound from a two-way driver design. Each speaker includes a 1″ aluminum diaphragm compression driver mated to 90° x 90° square Tractrix Horn and 5.25″ copper spun magnetically shielded IMG woofer. The tweeter and woofer are crossed over at 1800Hz. Tractrix Horn-Loaded Tweeter: Each speaker has a Tractrix horn-loaded 1″ aluminum dome tweeter for a natural, lifelike sound. The square Tractrix horn delivers a 90° x 90° dispersion pattern for a broader sound-stage. Copper Spun IMG Woofer: Each loudspeaker uses a copper spun IMG (Injection Molded Graphite) 5.25″ woofer for accurate midrange and midbass performance. Built-in Amplification: The Klipsch R-15PM’s “Right Speaker” employs a built-in, ultra-low noise 50 watt x 2 channel amplifier to power both speakers in the system. The built-in amplifier has been custom deigned to maximize driver performance and eliminate the need for external amplification. 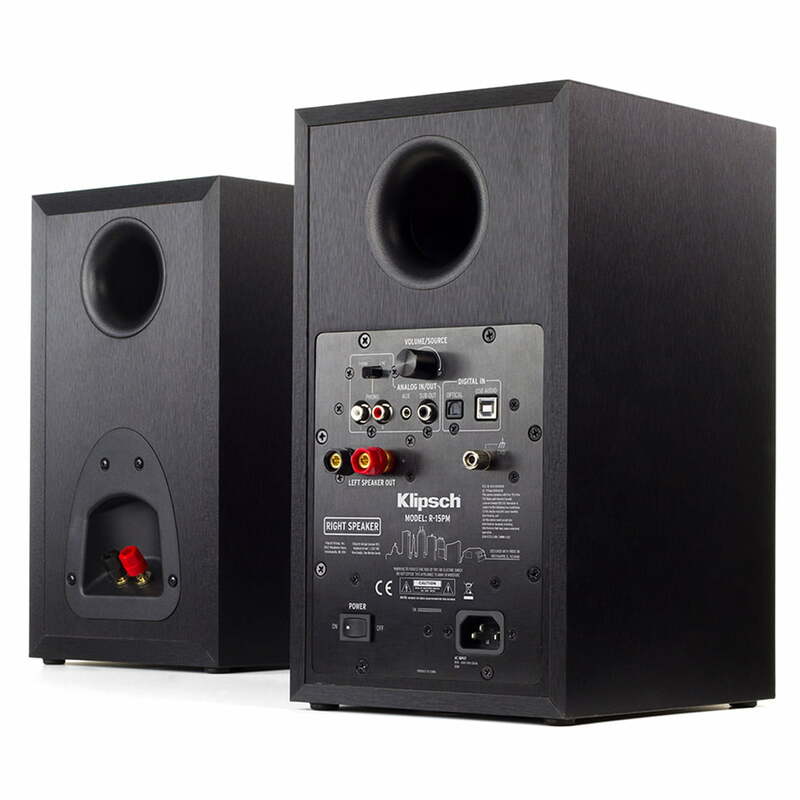 The “Right Speaker” and “Left Speaker” are fitted with binding-post speaker terminals on the back of the cabinet and come with 16′ of speaker wire (18AGW) to connect the speakers together. Bass Reflex MDF Cabinet: The Klipsch R-15PM employs a bass reflex enclosure with a rear-firing port for greater efficiency and bigger bass response. The ported enclosure features a MDF cabinet finished with a brushed black polymer veneer. The rigid MDF cabinet utilizes internal cross-bracing to minimize panel vibrations that can color sound. No grilles come with these speakers. Bluetooth Music Streaming: The Klipsch R-15PM active loudspeakers feature built-in Bluetooth A2DP/AVRCP technology which allows you to wirelessly stream audio from your Bluetooth-enabled Apple iPod/iPhone/iPad, Android smartphone/tablet, Windows PC/Phone, or Mac computer/laptop. You’ll be able to stream stored music or music apps from your Bluetooth-enabled device and control basic playback from the included remote control. Advanced playback control and song/artist information will still be done from your Bluetooth device. Once paired, the R-15PM will automatically re-connect with your device when in wireless range (up to 33′). Note: Due to the differences in Bluetooth technology, some Bluetooth enabled devices may be incompatible, function improperly, or may not support all features when used with the Klipsch R-15PM. USB-B Input: The “Right Speaker” of the Klipsch R-15PM features a rear-panel USB (type-B) input for connecting your Windows PC or Mac computer/laptop. Through the R-15PM’s USB connection, you are able to play music files (up to 24-bit/96kHz) stored on your Windows PC or Mac computer/laptop through the powered speaker system. Optical Digital Input: The Klipsch R-15PM is fitted with an optical (toslink) digital input on the back of the “Right Speaker” for connection to a digital audio device like your TV, Blu-ray, or CD player. The speaker’s optical digital input will accept 2ch stereo PCM only (up to 24-bit/96kHz). Dual Analog Inputs w/ Phono Switch: The Klipsch R-15PM is equipped with two analog audio inputs on back of the “Right Speaker”; there is one stereo minijack (3.5mm) input for connecting a portable audio device with a headphone jack and one stereo RCA input for connecting an analog audio component. The stereo RCA input has a Phono switch which allows you to connect a turntable, so you can enjoy your vinyl record collection. Sub Out: The Klipsch R-15PM features a mono-sub RCA output on the back of the “Right Speaker” that allows you to connect a powered subwoofer for added bass response. Your powered sub should have its own low-pass crossover. IR Remote: The Klipsch R-15PM includes an IR wireless remote control for wireless operation of the powered speaker, plus control of your Bluetooth paired devices. The remote offers easy access to system features such as dedicated source selection, volume up/down, play/pause, and previous/next track. Make sure to point the IR remote at the IR sensor on the “Right Speaker”. AC Power: The Klipsch R-15PM’s “Right Speaker” which is equipped with the built-in amplifer must be plugged into an AC power outlet using the included 68″ detachable AC power cord.